The Westbrook ice disc isn’t alone. It has 2 smaller cousins in northern Maine. Millinocket resident Michelle Simon photographed a spinning circle of ice in the Penobscot River near Abol Bridge on Sunday. 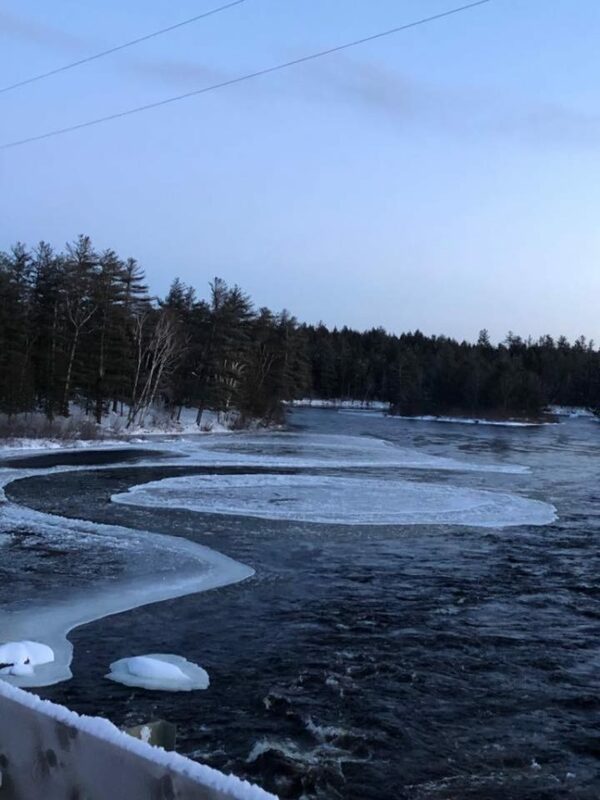 A second large spinning ice disc has been discovered in a Maine river, but it’s probably not going to attract the attention drawn to the one seen in Westbrook earlier this week. Michelle Simon of Millinocket was out with her boyfriend in Township 2, Range 10 northwest of Millinocket when she came upon another spinning hunk of ice in the Penobscot River south of Abol Bridge on Sunday. It was the second such river disc reported Thursday. Ranger Dave Loome observed another of this unusual phenomenon in Nesowadnehunk Stream in Baxter State Park, according to park officials in a picture on the park’s Facebook page at about 4:30 p.m. The ice near Abol was within 50 yards of the bridge, spinning counter-clockwise very slowly, and much smaller than the one in Westbrook, which onlookers say is about 100 yards in diameter. Simon, who has lived in Maine for most of her life, thought it novel enough to be worth photographing. 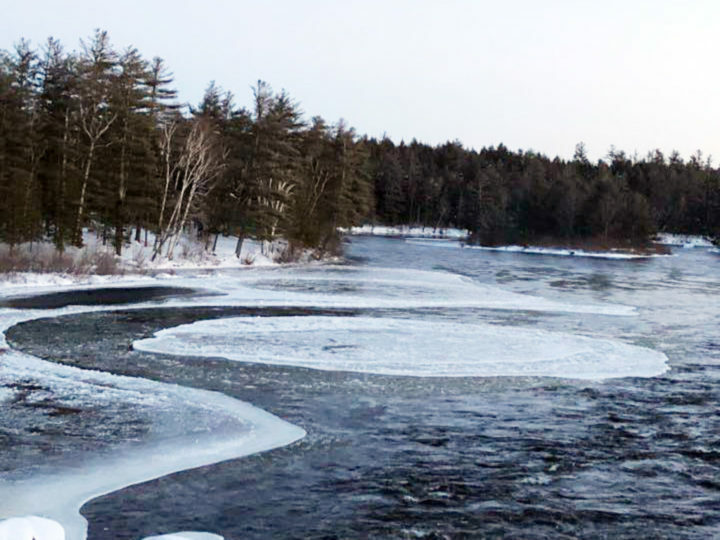 Then the Presumpscot River ice started drawing large crowds, making Simon wish she had shot video of what she saw. The current in that area of the Penobscot runs fairly swift and, unlike most of the water of northern Penobscot County, is open. Simon’s vacation rental business, Windy Point Cottage, is on Ambejesus Lake, which appears to be frozen solid and covered with snow, she said. Simon, whose family has run The Scootic In Restaurant of Millinocket for decades, wondered if the disc is still there. 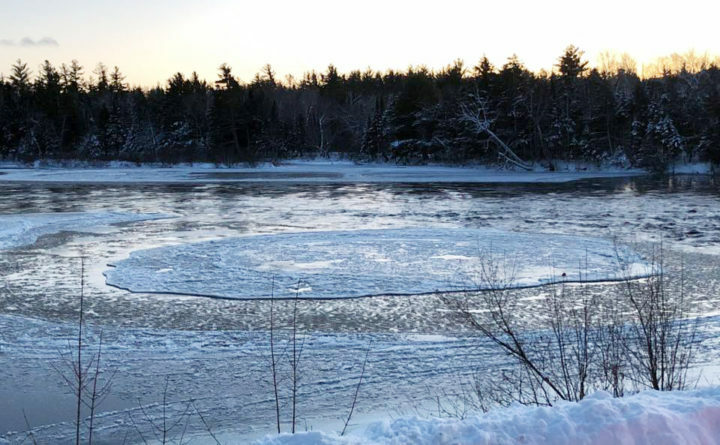 Temperatures over the weekend and into the early part of the week rose into the 20- to 30-degrees Fahrenheit range in northern Penobscot County, perhaps helping the ice disc to form in the river, before dropping down to about 5 degrees above zero, she said. The Westbrook circle has been perhaps most commonly and jokingly described as the product of aliens — a “frozen crop circle,” as one Facebook commenter said. Simon’s take on the ice she saw is more lyrical.